This year, in addition to its annual “all county read” book, my library system also selected a book in honor of Veteran’s Day, with lots of related events planned. 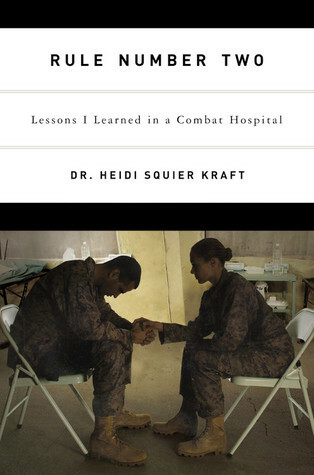 Since I participate in my library’s noon book group when I can, I read Rule Number Two: Lessons I Learned in a Combat Hospital by Dr. Heidi Squier Kraft. Everyone in the book discussion agreed it was a fascinating memoir about the author’s time in Iraq. Dr. Heidi Squier Kraft is a psychologist who spent nine years working for the US Navy. In January 2004, she was deployed to Iraq to serve as part of the medical support team for a group of Marines stationed there. She was given only 11 days’ notice, and her twins were just fifteen months old at the time. This memoir follows her experiences in Iraq – the good, the bad, and the ugly – while counseling soldiers enduring unspeakable horrors and trying to maintain her own sanity. The book’s title refers to a line from M*A*S*H (which taught most of us all we know of a wartime medical group): “There are two rules of war. Rule number one is that young men die. Rule number two is that doctors can’t change rule number one.” In her experiences in Iraq, Kraft found that many people – fellow medical personnel as well as soldiers – struggled to accept these basic rules of war. At the same time, she herself was also struggling to compartmentalize the part of her that was a wife and mother. She writes in a very direct and honest way, though she doesn’t dwell too much on any single case (other than one soldier’s death that especially haunts her). Many of her experiences were things I had never even considered about war, like the isolating role of the soldiers assigned to prepare the dead for transportation home or the difficulty of hearing about problems at home during her very brief turns at the computer. I found it particularly interesting to hear her perspective as a woman, since so many wartime memoirs are written by men. Overall, it is a captivating memoir that shines a light on something that most of us probably never think about (and something that we may purposely try not to think about, if we are honest). I felt enlightened as to the possible experiences of my nephew who served in Iraq in the Marines’ Special Forces. It was certainly a very appropriate book to read near Veteran’s Day, to remember the sacrifice that so many Americans have made, whether you agree with the reasons for the wars or not. The Best of 2012 lists are beginning to trickle out already. The first one I've seen is the Washington Post's 20 Best Books of 2012, which includes nonfiction, fiction, and graphic novels. I have only read one of the twenty books listed - Drama, a middle-grade graphic novel. I know, pretty pathetic that's it, right? What can I say? Too many books, not enough time! Interestingly, one of their top nonfiction picks, Katherine Boo's Behind the Beautiful Forevers, was the "all college read" selection for my son's freshman class at the University of Delaware. Jamie told me it was very good - I will have to borrow that one! How about you? Have you read many of the Washington Post's top 20 yet? Do you agree with their choices? For a peek at one of the first lists of best kids' books of 2012, check out Great Books for Kids and Teens. I hope you all enjoyed a wonderful Thanksgiving holiday with family and friends. We drove to Rochester, NY, (my hometown) for the long weekend, stayed with my dad and his wife, and enjoyed lots of visits with family and friends. It was a very nice weekend, and it was great to see everyone! Now we are back home, with lots to do! I am STILL working my way through Middlemarch by George Eliot. It is a hefty one, and I am feeling ready to move onto something else....but I am still enjoying it and want to see what happens - 200 pages to go! My husband, Ken, is reading Michael Connelly's The Fifth Witness (a Lincoln Lawyer novel) and enjoying it. Jamie, 18, can read in the car (lucky! ), so he finished City of Ashes (#2), read City of Glass (#3), and has started City of Fallen Angels (#4), in his quest to re-read Cassandra Clare's Mortal Instruments series for the third time, in preparation for book #5 which was recently released. Believe it or not, I did manage to post two book reviews before we left last Wednesday: Night Strangers by Chris Bohjalian, a spooky, suspenseful novel, and The Freedom Maze by Delia Sherman, a middle-grade/teen audio book. I enjoyed both novels very much. I chose Night Strangers by Chris Bohjalian as my Halloween week book, and it more than fulfilled my expectations of a spooky, suspenseful read! This novel contains both supernatural and real-life scary elements, combining a ghost story and a psychological thriller. Chip and Emily Linton move their family from Philadelphia to rural New Hampshire in an attempt to start over after Chip, an airline pilot, survives a horrifying plane crash on Lake Champlain after double engine failure. Unlike his hero Sully Sullenberger, though, Chip is left to live with the deaths of 39 of his passengers. With their twin 10-year old girls, Chip and Emily hope to make a fresh start in New Hampshire and begin by buying an old Victorian house on a hill near a small town. While Emily begins working with a new, much smaller law practice in a nearby town, Chip spends much of his time working on the old house and trying to recover from PTSD. He discovers a strange door down in the dirt-floored basement, sealed shut with 39 6-inch long carriage bolts. Yes, exactly 39. The coincidence is not lost on Chip, and he becomes a bit obsessed with the mysterious door and questions of who would lock it so completely…and why. The town welcomes the family warmly, especially the twins, but Emily has some concerns about the close-knit group of women who call themselves herbalists and seem so interested in their girls. She is also worried about her husband, who seems to be getting worse instead of better. Is he losing his grip on reality? Is he dangerous? From that auspicious – and suspicious – start, Bohjalian builds the suspense. This novel is completely unlike any of his others that I have read. It is a true ghost story but also a thriller. I found myself shouting at the pages, like you do (well, like I do) with a taut horror movie; in fact, the classic, “No, don’t go in the basement!” worked quite well in this case. I thoroughly enjoyed reading it, especially during Halloween week, though I ended up staying up much too late most nights and having disturbing dreams! Hello, Monday! I am very happy to greet a new week because last week was a rough one. My chronic illness flared up badly, so I was pretty useless all week (no reviews at all!). But I seemed to have turned the corner yesterday, so I am ready for a new week. I'm also excited for a Thanksgiving week filled with family, spending time with my sons and husband, as well as all the family members we rarely see. I am still reading Middlemarch by George Eliot. It is a hefty book, and I didn't finish in time for my book group meeting on Thursday, but I am now more than halfway through and am enjoying it very much. I have been pleasantly surprised by Eliot's writing talents - Middlemarch is clever and witty, and my book is filled with tabbed quotes that I loved. My husband, Ken, finished Neal Schusterman's Everfound, a teen/YA novel that we both enjoyed very much. Last night, Ken started Michael Connelly's The Fifth Witness ( a Lincoln Lawyer novel), a paperback I gave him for Father's Day. He and I have both always enjoyed Connelly's novels, and this seemed like a good choice for a week of travel and holiday hectic-ness! Jamie, 18, is still reading City of Ashes by Cassandra Clare for the third time! I'm sure he will use our long road trip this week to read. And that was it for this week! No reviews, but I did write a Weekend Cooking post, with a recipe for a quick and delicious black bean soup, and a tribute to Robert Louis Stevenson on his birthday. My chronic illness was badly flared up this week, so I didn't cook as much as I usually do. We relied on a few quick recipes, left-overs, and take-out. 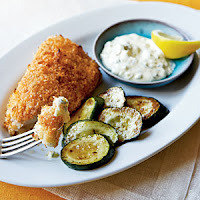 I did manage to cook some simple dinners, including Crispy Fish with Lemon Dill Sauce and Sauteed Zucchini (another Cooking Light recipe!). We've had this before, and it's very tasty, but our cod was a bit tough this time. 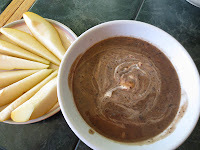 When the weather turned cold, I made some Black Bean Soup (my own super-easy recipe - see below) which we all enjoyed - warm and creamy, it was perfect for a cold, wet day. I tried some Tofutti brand non-dairy sour cream on top, and it was delicious! Now, I don't need to feel deprived of sour cream anymore! And tonight, with college son home for dinner, I will make another old favorite recipe from Cooking Light, Americana Pot Roast, one of my sons' favorite Sunday dinners. It cooks for 3 hours, but the preparation is actually quite easy and quick. And we'll have left-overs for tomorrow! Hope you had some good food this week, too. Sour cream or non-dairy sour cream substitute. Sauté onion, jalapeno, and carrots in oil over medium-high heat until soft. Add garlic toward end of sauté. Add broth and beans; partially mash beans with a potato masher, leaving some whole. Add spices. Bring to a boil, reduce heat, and simmer covered for 15-20 minutes, stirring occasionally. At end of cook time, remove soup from heat, scoop out 2-4 cups and process until smooth in a blender (leave center of lid off to allow steam to escape) or food processor, then return to pot and stir. (If you prefer the soup completely smooth, you can blend or process all of it; I prefer it with some whole beans and veggie pieces left). Serve with a dollop of sour cream (regular or non-dairy) and freshly ground pepper on top. 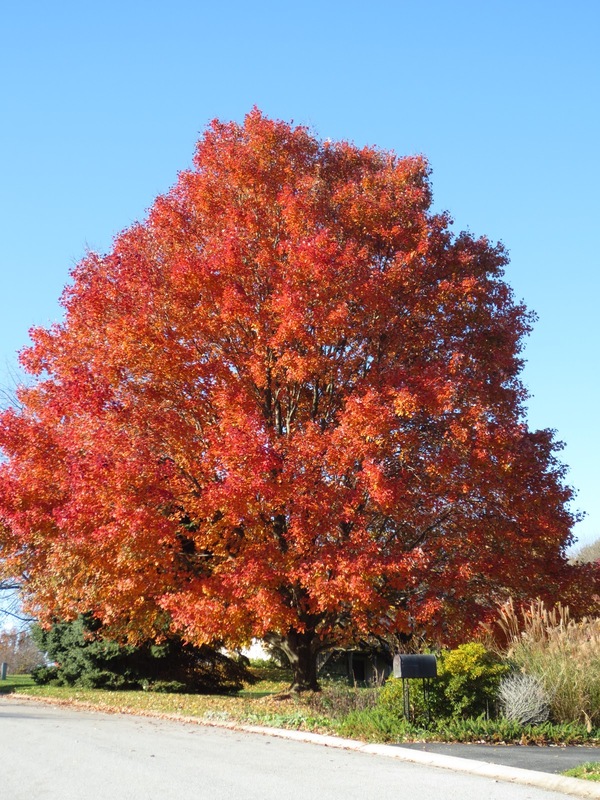 I smile everytime I drive by this tree. I will be sorry to see the last of the fall colors disappear in a few weeks. It was a long, tiring week but a lot of fun! After voting Tuesday morning, I drove to Connecticut to take care of my mom. She had hip surgery three weeks ago and still can't do much for herself. So, I was there to help, but it was also the first time she and I have had so much time alone together since...well, since my kids were born! We watched movies, read, talked for hours, and ate some delicious food together (see my Weekend Cooking post). We really enjoyed each other's company, in spite of the crazy weather last week. I came home to a busy catch-up weekend, planning meals, getting groceries, picking up the house, etc. Yesterday we had friends over for dinner. More fun, but today is definitely a recovery day. I am still working my way through Middlemarch by George Eliot. Whew, it is slow going! This classic novel is growing on me, and I am enjoying it, but I'm only on page 177 (of 799!!). Not likely I will finish in time for my book group meeting on Thursday. Yesterday, I began listening to it on audio when I am not able to read (free audio versions of classic books are available at LibriVox). All that driving time gave me lots of opportunity to listen to audio books! I finished The Freedom Maze by Delia Sherman, a middle-grade novel about a girl in 1960 Louisiana who goes back in time to meet her own ancestors in pre-War 1860. I loved this book, and its historical details were fascinating - it made the miles fly by! On the way home, I started The View from Saturday by E.L. Konigsburg, a middle-grade novel. It's good so far but different than I expected, using a 6th grade academic quiz bowl as the foundation to delve into the lives of four very different students. My husband, Ken, is reading Everfound by Neal Schusterman, a teen/YA supernatural novel that I recently finished and reviewed. Jamie, 18, doesn't have a lot of time for reading in college, but he is making his way through City of Ashes by Cassandra Clare for the 3rd time! 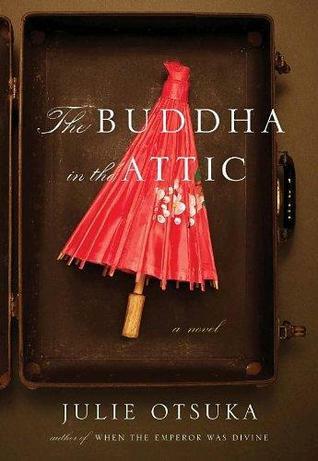 With such a busy week, I only had time to write one review, of The Buddha in the Attic by Julie Otsuka which my book group loved. And I posted my weekly Weekend Cooking summary. It was an unusual cooking week for me - and lots of fun! I drove to Connecticut to take care of my mom. She had hip surgery three weeks ago and can not yet do much for herself. We enjoyed watching movies and chatting, but I was also excited to cook for her because she and I like the same kinds of foods. Also, it gave me an opportunity to cook some more exotic type dishes that my kids probably wouldn't like! My mom is a partial vegetarian (she eats fish, seafood, and poultry), so we added that criteria to my restrictions of no dairy and limited gluten. No problem. As is typical, all of the recipes came from Cooking Light, and we had some delicious meals! 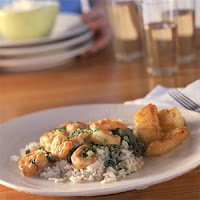 The first night I was there, I went for a super quick and easy old favorite that I have made several times before for my husband or friends when the kids aren't around (they're not too fond of either asparagus or coconut milk), Spicy Thai Coconut Shrimp. This goes together in about 15 minutes and is sooo tasty! My mom loved it so much that she told her visiting physical therapist about it, and she took the recipe home and made it that night! Heat a small frying pan or sauce pan over medium-high heat and spray with cooking spray. Add halved pecans (it only takes a tablespoon or two for each serving). Sprinkle with a half teaspoon of sugar and a quarter teaspoon of cayenne pepper and stir constantly to prevent burning. When pecans are toasted but not burned (watch carefully! ), add to salad. Both the main course and the salad were yummy! I went all out on my last night there. My mom and I both love Indian food, but I have found eating in an Indian restaurant upsets my stomach severely since I became dairy-intolerant because they usually add yogurt and/or cream to many of their dishes. So, instead of take-out, I made our own dairy-free Indian dinner. I made Red Dal and served it with brown Basmati rice (a favorite from Trader Joe's) with peas. 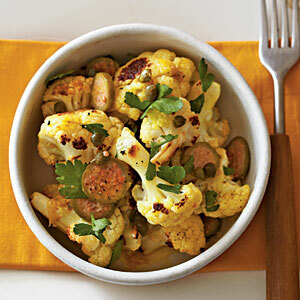 Although it isn't actually Indian, I also made Curried Cauliflower with Capers. We both loved it! I had never roasted cauliflower before; it was delicious, and I will definitely make it again here at home. I wish I had taken a picture of the meal, but I was too excited to eat it and forgot! So, those were my culinary adventures for this week! Back at home, I returned to more basic cooking: grilled pork chops with roasted butternut squash, my son's favorite pasta dish. We are having friends over for dinner tonight and keeping it very simple to save my energy for socializing - make-your-own soft tacos/burritos. We will just grill some chicken breasts, slice them up and set those out with tortillas and a variety of other fillings like lettuce, tomatoes, salsa, refried beans, gaucamole, etc. It's a great, easy meal for a crowd (especially one with a wide variety of food intolerances like tonight's group!). 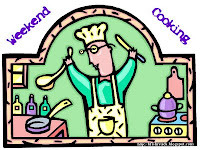 Hope you also enjoyed some great food and cooking this week! It has been a week of contrasts! I drove to Connecticut on Tuesday to help take care of my mom who had hip surgery three weeks ago. She and I had a wonderful week together (check back tomorrow for Weekend Cooking to see all the great food we cooked and ate), but the weather's been crazy! The storm brought snow to CT.
By Friday morning when I drove home, the roads were clear and so was the lovely blue sky. Though the trees near NYC were mostly bare already, just 100 miles further south, I admired the colors remaining in the trees along the southern end of the NJ Turnpike. The last of the fall colors along the NJ Turnpike. And now it's supposed to be in the 60's this weekend in Delaware and above 70 by Monday! 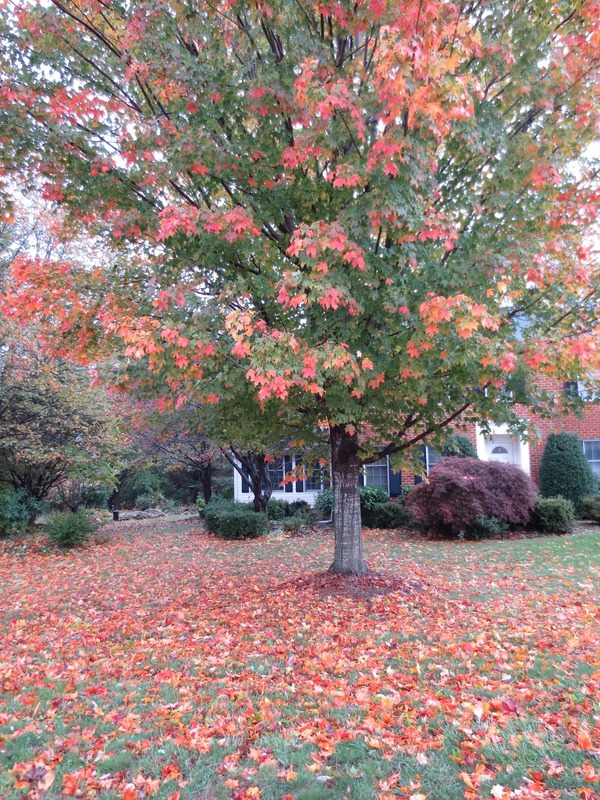 We've had a taste of 3 different seasons all in one week. Hope you are enjoying this lovely weather this weekend. My neighborhood book group met recently to discuss The Buddha in the Attic by Julie Otsuka, a tiny but powerful novel about the experience of Japanese girls who immigrated to the United States in the early 1900’s as “picture brides.” We gave the book one of our highest ratings ever, since every single person enjoyed it (a rare occurrence!). On the boat we were mostly virgins. We had long black hair and flat wide feet and we were not very tall. Some of us had eaten nothing but rice gruel as young girls and had slightly bowed legs, and some of us were only fourteen years old and were still young girls ourselves. Some of us came from the city, and wore stylish city clothes, but many more of us came from the country and on the boat we wore the same old kimonos we’d been wearing for years – faded hand-me-downs from our sisters that had been patched and redyed many times. Some of us came from the mountains, and had never before seen the sea, except for in pictures, and some of us were the daughters of fishermen who had been around the sea all our lives. Perhaps we had lost a brother or a father to the sea, or a fiancé, or perhaps someone we loved had jumped into the water one unhappy morning and simply swum away, and now it was time for us, too, to move on. You can see that, in addition to the use of the pronoun “we” throughout the novel, she also writes in a very spare, almost poetic prose that helps to tell the stories of an entire generation of women in a scant 129 pages. The novel follows the women from their arrival in California to their dispersal to a wide variety of husbands and through the next twenty years, until the bombing of Pearl Harbor when they were all rushed off to internment camps where their entire culture and population disappeared from the west coast for several years. The women were dispersed into a wide range of situations with their new husbands: some as very poor migrant farmers who were even worse off here than they’d been in Japan, some as domestic servants to wealthy white people, and some as small business owners in large cities. The novel follows the arc of their lives, through the difficult adjustment to a new culture (some never did adjust), through the early years of marriage (where some found love and some found misery) and the later years of raising children while still working in the fields or the house or the noodle shop or the cleaners. The author very skillfully shows the common threads of experience through all of these disparate stories, and my book group was all fascinated by the unique perspective. It’s a population none of us knew much about, and we were intrigued to learn how similar some of their experiences in this new world were one to another and to other immigrant populations, despite their very different circumstances. My only minor complaint was that the book felt like it ended abruptly to me, and I would have liked to know more about these women’s lives in the camps and after the war. However, I think, again, that this was an intentional and very clever choice on the part of the author, to show with that abrupt ending how an entire group of people suddenly disappeared from our culture and how the camps served as the end of an era for an entire immigrant population. All in all, we agreed that this very unique and powerful novel was well-written and engaging – highly recommended. Wow, what a week we had last week! 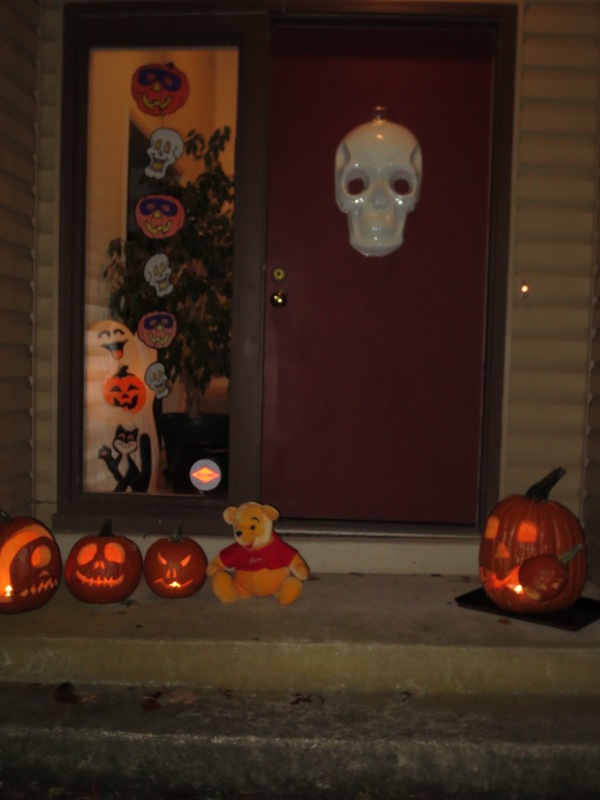 We were stuck in the house, with school cancelled, for several days due to Hurricane Sandy (though we suffered no damage), then we had Halloween. Life finally began to return to normal on Thursday and then it was the weekend! So, I didn't get much work done; I am way behind on reviews! I finished Everfound by Neal Schusterman at the beginning of the week. I loved this exciting conclusion to the imaginative teen/YA Skinjacking trilogy...and I even made sure to post a review right away, in time for Halloween! 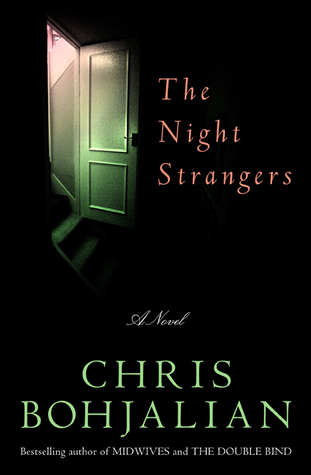 Next, I read a fabulously creepy book, Night Strangers by Chris Bohjalian. This one exceeded my expectations with edge-of-your-seat suspense that kept me reading much later than I should have every single night with a mixture of both supernatural thrills and too-real human-type chills. I just finished it yesterday, so I will post a review this week. My husband, Ken, took full advantage of being stuck inside by the storm and zipped through the hefty The Twelve by Justin Cronin in a mere week! I can't wait to read this long-awaited sequel to The Passage! Now Ken is reading Everfound by Neal Schusterman - we just pass books around in our house until everyone has read them! Jamie, 18, came home for the storm (college was closed for several days) but forgot City of Ashes, book #2 in Cassandra Clare's Mortal Instruments series (which he is re-reading) in his dorm room. Despite piles of new books all over the house, he refused to start anything else and instead played video games with his brother! I posted just one review last week, of Everfound, a teen/YA novel by Neal Schusterman. I also wrote some fun posts: my October Book Summary and a new Weekend Cooking post. Our son and his friend dressed as old men for Halloween, so Ken and I dressed as toddlers! My meal planning was a bit different this week because our CSA season is over which means I am no longer planning meals around whatever fresh veggies I pick up at the farm on Monday. So, I went with some old favorites and easy stuff. Once the roads re-opened after Hurricane Sandy, my son's friend was finally able to go home, and we were back to just the four of us (my college son was home for an extended time since there were no classes for 3 days). I made an old favorite we all love, Chipotle Tamale Pie, another Cooking Light recipe that I turn to again and again. I just subbed coconut milk for 1% milk and gluten-free flour for regular flour. Yum! You just stir fry thin strips of pork (or chicken), then remove them from the pan. Stir fry a bunch of veggies - I usually use bok choy (I had some baby bok choy left from the farm), scallions, mushrooms, and frozen peas. Make a space in the center of the stir fry pan and scramble 2-3 eggs (I mix in a teaspoon or so of sesame oil). When the eggs are cooked, add the meat back in, stir it all together, add in cooked, cooled rice (we use brown rice), and season to taste with soy sauce and ground pepper. Very tasty and great for left-overs. By then, we were getting down to the bottom of the veggie bin (still hadn't been shopping since before the storm), but I managed to scrape together enough ingredients for a basic Chicken Stew. I thought I'd add in some dumplings as a special treat for my husband and son, but they turned out like little concrete balls! ha ha I have been baking gluten-free for several months now, and I guess the whole wheat baking mix in the cupboard might have been a bit old. The stew was still good, though! Friday night, my son talked me into putting the pork chops back in the freezer and ordering Chinese take-out - it didn't take much convincing! And I made a double batch of Traditional Chili yesterday to take to a friend's house for a potluck. I got the recipe from my college roommate's mom - it's been scribbled in the back of a notebook since 1985! It's a very basic, traditional chili, but it's still my family's favorite. I am looking forward to having some left-overs for lunch today! And tonight, I am making Shrimp and Sausage Gumbo, another of our favorite recipes that I created based on our years in Louisiana. That one hasn't been published, though, so I don't have a link. Hmmm....maybe I should start reprinting some of my recipes here each weekend. And I definitely need to start taking some photos when I cook. This is fun! Hope you have had a great week and a weekend filled with good food! 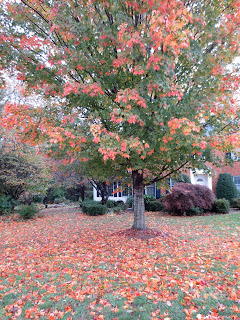 Hurricane Sandy dumped a lot of leaves on the ground but still left some in the trees. A rainbow of color was left on the ground after the storm. We were very, very fortunate not to suffer any damage from this horrible storm - we never even lost power - and our thoughts and prayers go out to those who are still suffering. I hope you had a Happy Halloween and haven't been too badly affected by the storm. Its center came right through our area, but we were fortunate not to lose power or sustain any damage at all. So, we were able to enjoy a fun Halloween yesterday. I thought I'd try being proactive for once and not procrastinating on my month-end summary until it is almost the next month! Everfound by Neal Schusterman, the conclusion to the Skinjacker trilogy that began with Everlost. See? A nice variety - several teen/YA novels, a middle-grade novel, a memoir, and a grown-up novel. I enjoyed them all, but I guess Everfound was probably my top pick for the month (Schusterman is a favorite author! ), though Young Fredle is a close second. Ooh, and I see I am really behind on reviews of grown-up books; I was sick much of this month, so I hope to catch up on those soon. I made a little progress on my 2012 Reading Challenges this month. I only added one location to my my 2012 Where Are You Reading Challenge: Rule Number Two takes place in Afghanistan. Unfortunately, The Chocolate War and Young Fredle both take place in unspecified states, and I had already checked off the states for the other books I read. So, with only 2 months to go in the year, I have read books set in 22 states and 6 countries (with plenty of duplicates). Magisterium brings my total of dystopian novels read this year up to seven! The Hunger Games has obviously created a trend in teen publishing! I didn't read a single book from my TBR shelves this month (very bad!) but got my books from the library and new releases from publishers. I added 1 memoir to my Memorable Memoirs Challenge. What books did you most enjoy in October?